Joe Gormley scores for Posh against a Spurs XI. Photo: Joe Dent/theposh.com. Peterborough United striker Conor Washington believes his partnership with new signing Joe Gormley will be the key to success in League One this season. 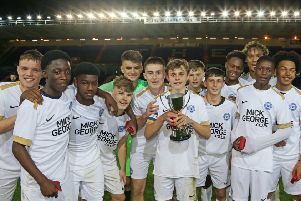 Washington scored his second goal in four games on Saturday as Posh ran out 3-2 winners over a Spurs XI at the ABAX Stadium yesterday (July 18). The former Newport man pounced on some sloppy Spurs defending before coolly round the visiting keeper and slotting home. Gormley also scored to make it three goals in his four summer outings. Washington said: “It’s always nice to get a goal, but it was a bit of a leggy performance all round following a tough week in Ireland. “It definitely helps when you have a consistent strike partner to play alongside which is something that we lacked last year. “Joe is great to play alongside, He has so much talent and we have similarities and differences in our game so we work well together. Washington has scored 17 goals since arriving at Posh for a fee believed to be around £500,000 in 2014. He is confident he can live up to the high expectations of manager Dave Robertson and chairman Darragh MacAnthony. Both believe that Washington is capable of scoring 20 goals in a League One season. Washington added: “It is a big season for me. It’s my second full season here and I want to take my good form at the end of last season into the one ahead. “I feel the way we are trying to play this season has improved the service to the strikers so far in pre-season which is vital. We really struggled to create chances last season, but with the players we have brought in and the different tactics we are using I feel that we will be able to carry on scoring goals when the League One season starts. Posh have scored 15 goals in their four friendlies. They are next in action at League Two newcomers Barnet on Tuesday (July 21, 7.45pm kick-off).